Today the sun is shining. I am so grateful. There have been too many dreary cloudy rainy days this spring. Growing up our family didn’t do Easter baskets, Easter dresses or the Easter Bunny. There were a few years I felt pretty ripped off because my best friend got all sorts of goodies when she woke up on Easter morning. I wasn’t a neglected child, there was Easter candy around the house and we did do Easter egg hunts but it was very important to my parents that we learned what Easter really is about, our Savior Jesus Christ. A perspective now I appreciate so much more as an adult. I will do the same in my household. Right now my kids are too young to care but we are already teaching them what Easter is really about, the resurrection of Jesus Christ. We will still have yummy treats or have some Easter egg hunts but the center of our Easter celebration will be Christ centered. Jesus Christ came to earth and lived and died for each of us. He was resurrected and came back a perfect being. He is my Savior, and my dearest friend. I am so grateful for his example and his sacrifice he made for me. May you enjoy your Easter weekend and not get too clouded in the goodies that have evolved around it! Melt the butter in a large sauce pan over medium heat. After the butter is completely melted add the marshmallows. Once the marshmallows have melted take off the heat and stir in corn flakes. Allow to cool for a moment then take large scoops of the mixture and place on waxed paper. 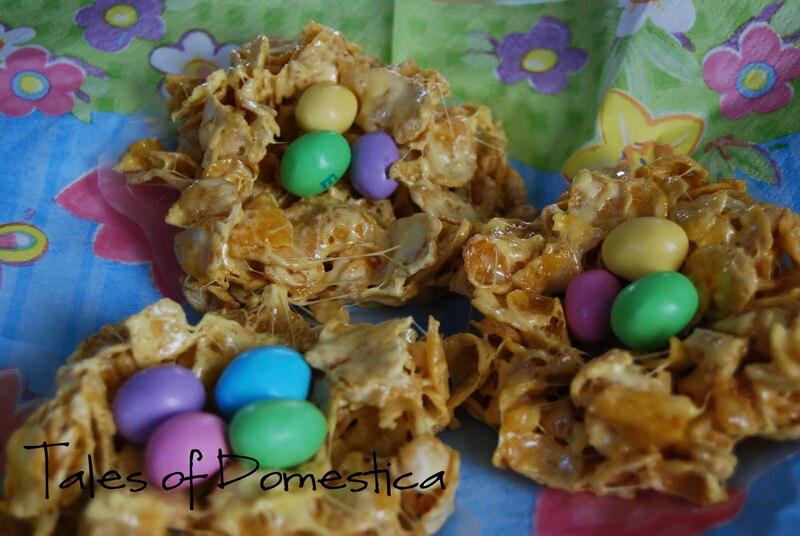 Shape into nests with your hands and add M&M “eggs”. Makes 12 large nest treats!